Continuing my attempts at computational archaeology: before the dawn of the dawn of time … or at least the dawn of the Internet … computer people had .plan (“dot plan”) files, chunks of text you could read from the command line using the finger protocol. This protocol is often deactivated nowadays, but it was Facebook at graduate school at Georgia Tech in the early nineties. The following was mine, from apparently late 1995. 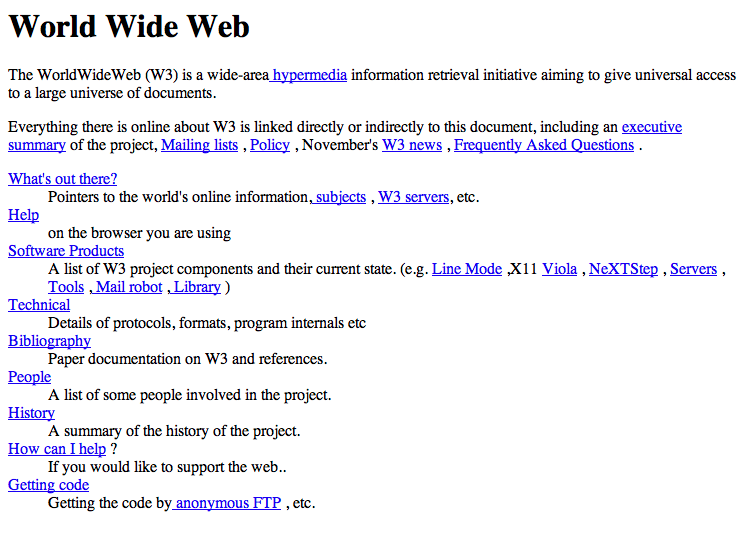 Like my attempt to find my first web page, this obviously isn’t the earliest version of my .plan file, but at ~15 years it’s the oldest bit of online presence I’ve found about myself yet. Hi. 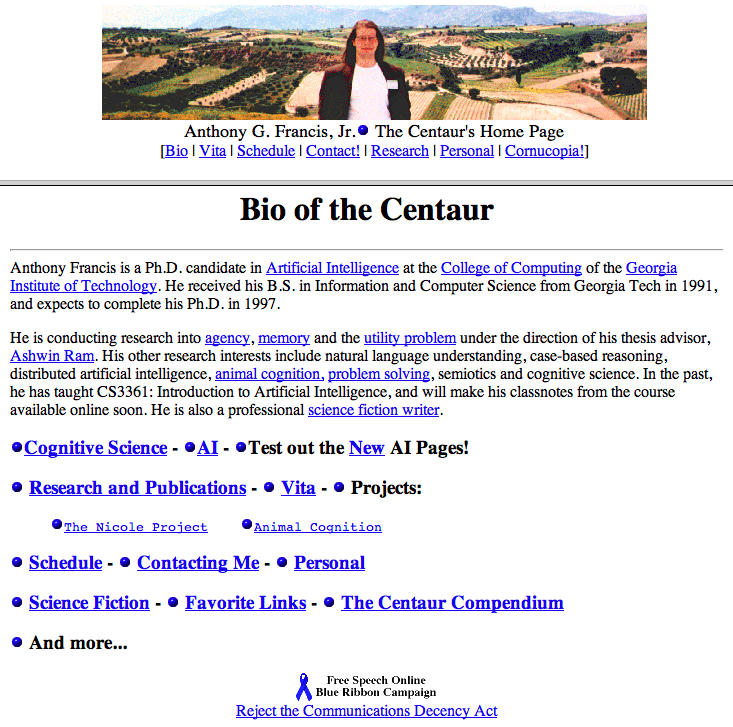 This is the personal page of the Centaur, otherwise known as Anthony Francis. 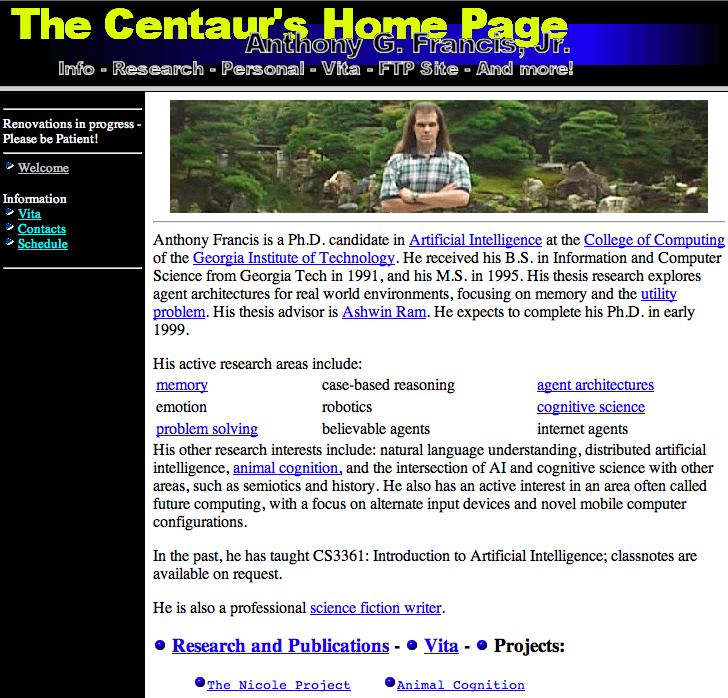 I’m ostensibly a graduate student in Artificial Intelligence at the College of Computing, but that’s just a hobby. 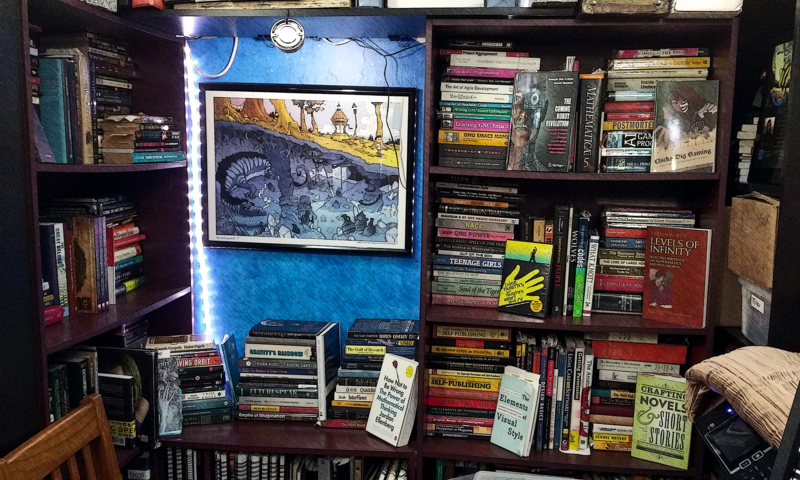 For the past eight years, I’ve been a science fiction writer, a vocation that became professional when I published my first short story, “Sibling Rivalry,” in the February 1995 issue of _The Leading Edge_ magazine. The love of my life is a redheaded historian, Shannon Duffy. When I’m not with her I spend time with my best friends in the Edge Group, which consists of Michael Boyd, David Cater, Anthony Francis, Derek Reubish, David Stephens, and Fred Zust in the core Edge franchise as well as William Morse, and Stuart Myerburg in our recently opened Atlanta branch. I’m sorry, I can’t tell you what we at the Edge Group do; we’d have to kill you (we do bad movies, good software, and great times, in no particular order). When I’m not hanging with the Edge Group I’m jamming with my other best friends Steve Arnold, Eric Christian and his fiancee Chalie, Joe Goldenburg, Kenny Moorman and his wife Carla, Ruth Oldaker, Mark Pharo and his wife Yvette, Patsy Voigt, and Fred’s girlfriend Marina. The weekend tradition is to jam with William, Stuart, Mallory and sometimes Joe at Anis, Huey’s, Oxford at Pharr, Phipps and wherever else we can get into trouble. (Occasionally, you can find me at the Cedar Tree or Yakitori Den-Chan with Mark & Yvette). If not, I’m either hanging with Fred & Marina, Eric & Chalie and Dave & Ruth up in ole Greenvile, South Carolina, watching (or filming) movies at my house, eating dinner with my loving parents Tony and Susan Francis, perforating the odd target with musket fire at Eric’s or just noshing on late-night food at Stax’ Omega or IHOP. If I’m not doing any of the above, I’m liable to be curled up with Shanny in O’Flaherty’s Irish Channel Pub in the French Quarter in New Orleans, listening to Irish ballads and soaking up each other’s company over an Irish Coffee (her) and a diet Coke (me). My favorite cuisine is Lebanese, a gift from my parents and my family, the best damn extended family in the whole wide world. I shock my parents and family by also appreciating Chinese, Japanese, Thai, Cajun, Mexican, Italian, Korean, Vietnamese, Spanish and Indian cuisine; I also have a great appreciation for the foods of the South, a culture which I find to be both vastly underrated and overdiscussed abroad. When I’m not dining out or curled up with a good book or laptop computer at Captain D’s at Corporate Square in Atlanta drinking inordinate amounts of iced tea, I’m at home honing my patented personal tabbouleh (Lebanese salad) recipe, slowly learning to cook Chinese, and honing the art of grilling steaks and microwaving potatoes so that they both finish at the same time. 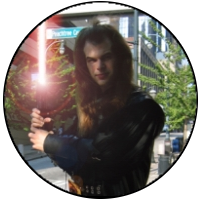 My favorite form of literary expression is science fiction; my preferred style is flashbacks within a framing story, usually in third-person limited, although I’ve begun to experiment with a more liberal third-person style derived from the narrative structure of contemporary motion pictures. My primary means of plotting and expression are visual images. My favorite fictional creature is, of course, the centaur; however, the genetically engineered spaceborne professionals of *my* fiction bear little resemblance to the bearded primitves that stalk the wooded glades of your average fantasy novel (unfair though that may be to my inspirations, which include the very nice halfhorse folk of the Giesenthal valley dreamed up by Donna Barr, the ambiguous Titanides from _Titan, Wizard, Demon_ by John Varley, and Timoth the warrior sage of the Advanced Dungeons and Dragons comic. Just don’t call my Porsche St.George a halfhorse too; she’ll be liable to pummel a fictionalized version of you in a story sooner or later if you do). My favorite style of AI is symbolic AI with a situated/behaviorist twist. I play around with memory, agents, case-based reasoning, natural language understanding, and semiotics; I have nothing against genetic algorithms or connectionist systems other than the fact that I don’t have time to pursue them as avidly. I also fiddle around with animal cognition, and can talk your ear off about chimpanzee culture and dolphin language if given the chance. My favorite style of science is Kuhnian with a cognitive flair. I have no respect for positivism or any of the horrible things it’s done for science. My philosophy is somewhere between Kant, Plato and something no-one has a name for yet. 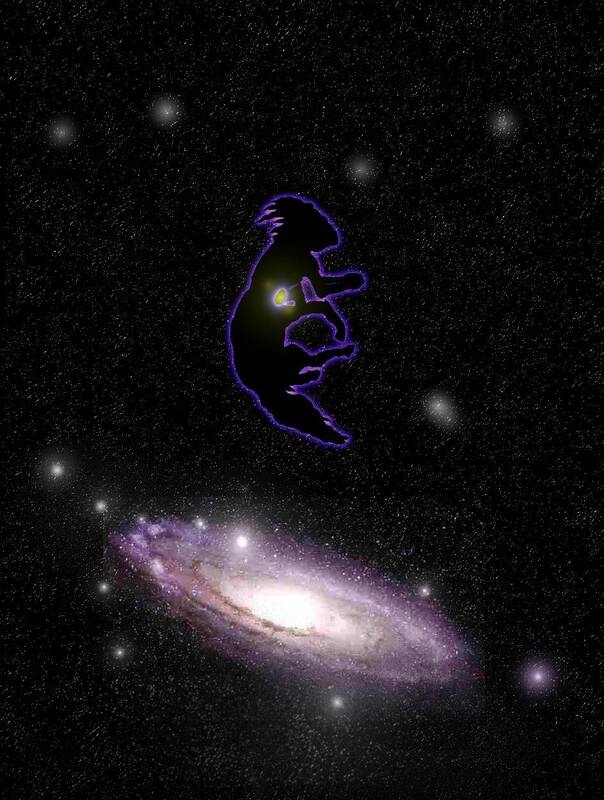 To sum: the universe is real; deal, but don’t assume you have the answers and *don’t* assume that a single level of description can capture all of reality. Politically, I am a Goldwater liberal. I believe in war, gays in the military, religious freedom, no state-mandated prayer in schools, free ownership of automatic weapons, licensing of gun owners, aid to the Contras, prosecution of IranContra, investigation of Whitewater, and support and respect for the president regardless of party. I voted for George *and* Bill once each, don’t regret it, and would do the same knowing what I know now. I believe in AIDS spending, military spending, research spending, and the space program; I also believe in welfare reform, cutting waste, a line item veto, and perhaps even some kind of budget amendment if I could be convinced it wouldn’t get us into trouble in wartime. I don’t believe in “school choice”, “political correctness”, “multiculturalism”, “Rush as Equal Time”, “the liberal media”, “the conservative media”, or “anti-special-rights amendments”. I don’t think we should take “In God We Trust” off of our coins and I don’t think we should picket funerals of people who had AIDS. I don’t believe acceptance of homosexuals as equal citizens has anything to do with the disintegration of the American family. I don’t believe in hobbling industry with overregulation nor do I believe in letting them cut down trees holding endangered species just because they planned our logging programs poorly. My political heroes are Barry Goldwater, Ronald Reagan, Bill Clinton and Margaret Thatcher. Interesting. Well, that is what it was. There are definitely opinions I would tweak, things I now think I got wrong, and snapshots of relationships that no longer hold. But the Edge is still here, I’m still here, I’m still writing, I’m still a Christian, and still a scientist. SO, all things considered, I think I’ll have to stand by my dot plan file after all. Amazing, yes, the frames, the under construction sign, the ‘bouncer look’ photo, etc. What amazes me even more? It’s still up, as of 2010-07-16. Wow. How things have changed in two short decades. 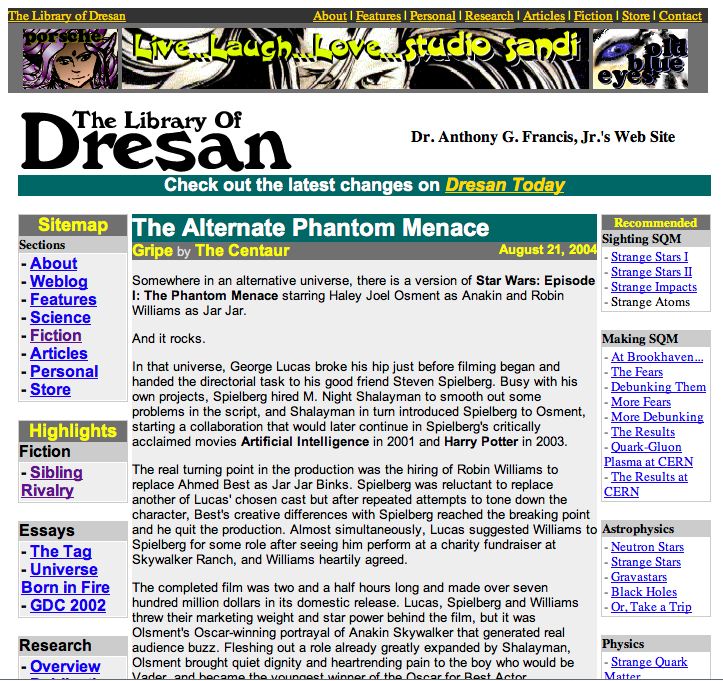 Way back in the dawn of time, the Library of Dresan looked very different. And I didn’t just write all the articles … I formatted all the HTML by hand. Now, thank goodness, publishing to my blog is easier than I ever imagined, back in the day (and no, I’m not going to snark about Blogger having as many problems then as now, it served me well for many years before it, well, finally stopped serving me well). SO ANYWAY, I’m reblogging all of the old articles of the Library, tagged now as, um, Reblogging. I will of course leave the original Articles up for historical interest and my eternal embarrassment. I mean, adding banner ads to my own site … pointing to my own site! What was I thinking? Really, next I’ll get so self-referential I’ll be critiquing myself as I’m writing this!